Hampi (Vijayanagar) Bellary District: Virupaksha Temple Complex. 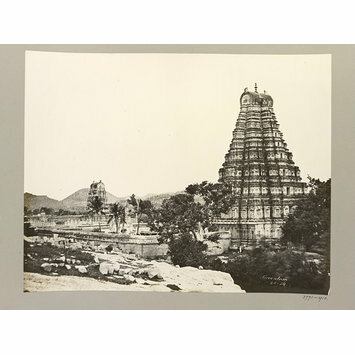 This photograph shows the Virupaksha temple complex, Hampi (Vijayanagara). This photograph shows an oblique view of a temple complex set in a rocky landscape with surrounding trees and hills in the distance. This enclosed rectangular complex has two towering gateways, or gopuras, at either end. The larger of the two has ten receding storeys and the smaller has four storeys, all ornately carved with figures, pilasters and recessed moldings. Both are mounted with ornate barrel-shaped structures. The two gopuras dominate the temple complex which contains smaller shrines and pillared structures. Also glimpsed is a third, far smaller gopura set into a central wall which divides the complex into two sanctuaries. Next to the largest gopura are a couple of figures, posed presumably to indicate scale. Inscription bottom right. The negative is inscribed 'Greenlaw 28-56' and this appears in the bottom right hand corner of the photograph. Dominating the sacred centre of Vijayanagara, the Virupaksha temple complex is situated between the Tugrabhadra River and Hemakuta Hill and is approached via the colonnaded Hampi Bazaar. This temple remains the most important at the site today and its main gopura, or towered gateway, in the eastern wall facing Hampi, is the largest at Vijayanagara. The rectangular complex is divided into two sanctuaries connected by a small gopura. Another medium sized gopura is found in the north facing enclosure wall between the main, early shrine dedicated to Virupaksha in the western sanctuary and the Tungrabhadra River. Still in use today, this complex was constructed in greater part in several phases during the sixteenth century. 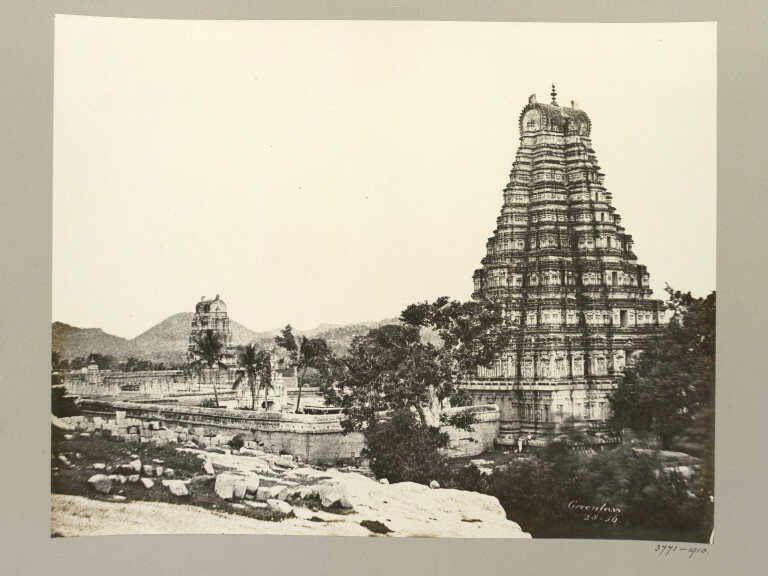 For other views of this temple complex within the series, see 3768-1910, 3769-1910, 3770-1910 and 3772-1910.